I came across this old photo taken in Pebble Mill newsroom, in the early 90s at a guess. 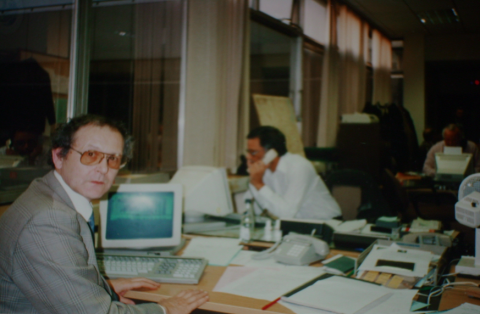 I am in the foreground and also on it are Harvinder Singh, a newsroom stalwart who still does news shifts at the Mailbox, and Bob Sinkinson, Network News reporter, now retired. It looks like it is the old assignments desk, with me as intake editor and Harvinder on Camera Diary, controlling the movements of the crews and reporters. The early computers were the Hewlett-Packard BASYS system and were very rudimentary. There is the reflection of a red light at the end of the newsroom, indicating transmission. I fondly remember them all. Especially Mr Blisson’s humour – always constant and sometimes funny. Maurice and I worked together in Stoke. He was the driest, funnyman I ever knew. We would swap one-liners at Pebble Mill. He could be such a pedant….and so am I now, to this day, thanks to him. I await his corrections to this posting !!! !